You would be hard-pressed to find a town more diametrically opposed to KoyaSan, where circumspection and reflection are the daily maxims. After our time up in the mountains, entering Osaka Dontonburi Arcade (the heart of the city’s entertainment district) presented us with a visual and auditory wonderland dialed up to 11. The buildings stretch skyward, urban mountains in their own right, and the signs flashed vivid neon at such a rate we worried they might trigger seizures. 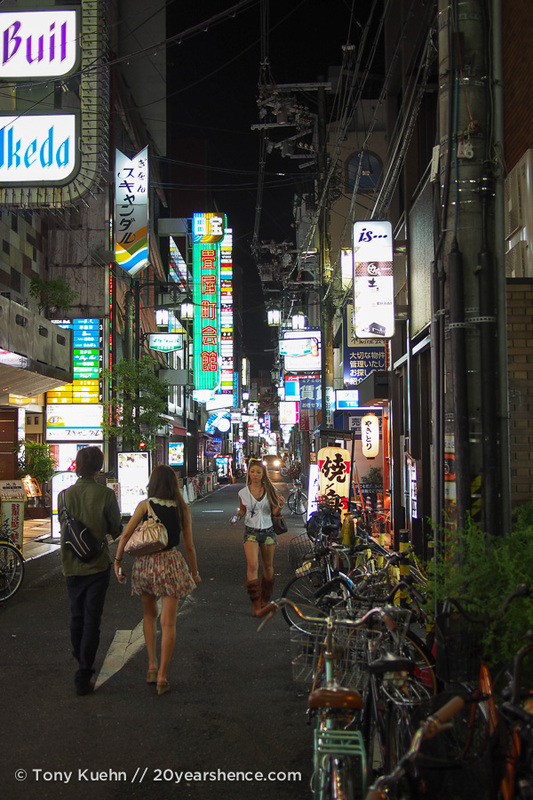 It was everything we had wanted Tokyo to be – larger than life, bustling chaos, an explosion of color and life. In comparison, Shibuya Crossing and even Times Square in New York City seemed muted and restrained. Standing in the center of it all, we felt like we were in the eye of a hurricane of overindulgence, and it was awesome! We are so glad that Hirano, whom we met at the monkey park in Arashiyama, recommended that we stay in the Shinsaibashi & Namba areas of the city. This is where Osaka truly sparks to life, and if you’re going to visit the city, you want to be in the thick of it all. Osaka does have a castle and even its fair share of temples (it is Japan after all! 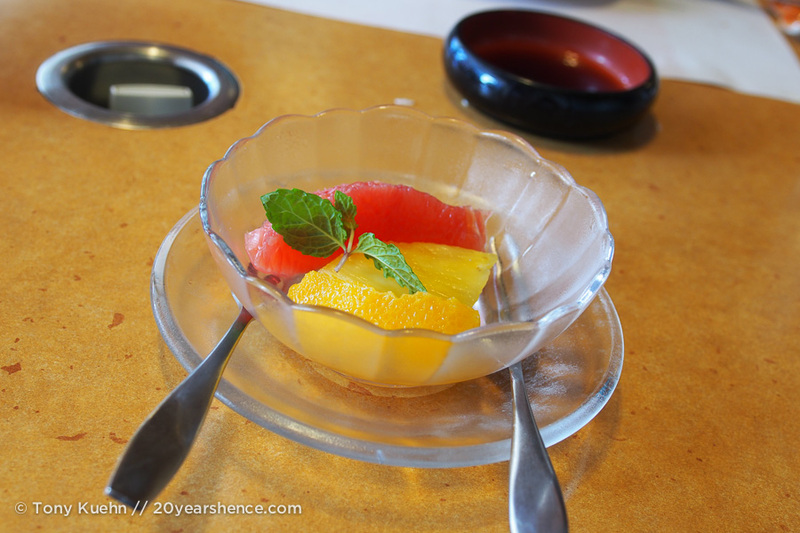 ), but we were in town to live up our last few days in Japan, so we spent most of our time just wandering the streets, people watching, and, of course, eating! So dedicated are Osakans to the pursuit of eating that there is actually a theme park of sorts that revolves around food! Situated next to the Kaiyukan aquarium, Naniwa Kuishinbo is mocked up to look like an olde tyme Japanese marketplace (if you consider ’60s Japan “olde tyme”) and features various shops and stalls that serve traditional dishes. We were a bit dubious as to the potential quality of the food, as we envisioned it would be like carnival food and not executed very well. However, the smells that were cooked up here were absolutely amazing, and it didn’t take us very long to decide we needed to sample something. I chose SORA, which despite the inclusion of the poorly named “fibrous beef” made claims that it would enhance my beauty due to the high collagen content… how could I resist?!? Seriously though, the beef was slowly simmered in an addictive miso-laced sauce so that the meat was exceedingly tender and it was all incredibly delicious. (So delicious that we forgot to take a photo!) And yes, the high fat content meant that the dish was also very rich. As far as beauty goes, I probably would have been better off smearing it all over my face rather than letting it go straight to my thighs, where I’m sure I’ll forever carry a bit of this dish! Truly getting into the spirit of our time in Osaka, we decided we needed on splurge meal. For this occasion, we chose a meal at a restaurant that just so happens to be one of Dotonburi’s most iconic landmarks: Kani Doraku. 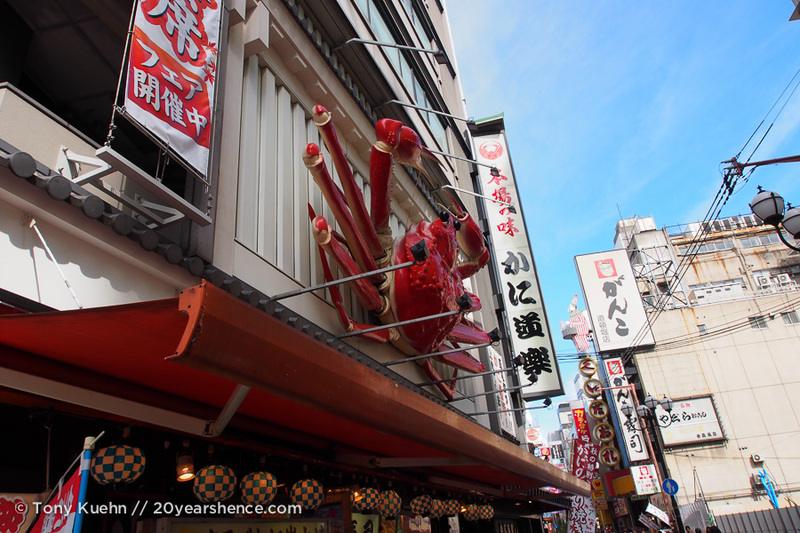 At this point, it is hard to know whether the restaurant is more famed for the crab it serves inside or the huge mechanical crab that adorns the exterior of the building! Although Tony & I tend to feel ambivalent about crab, we both decided that if ever there was a chance we would really appreciate it, it would be due to a meal here, so we decided to go for it and have lunch here. 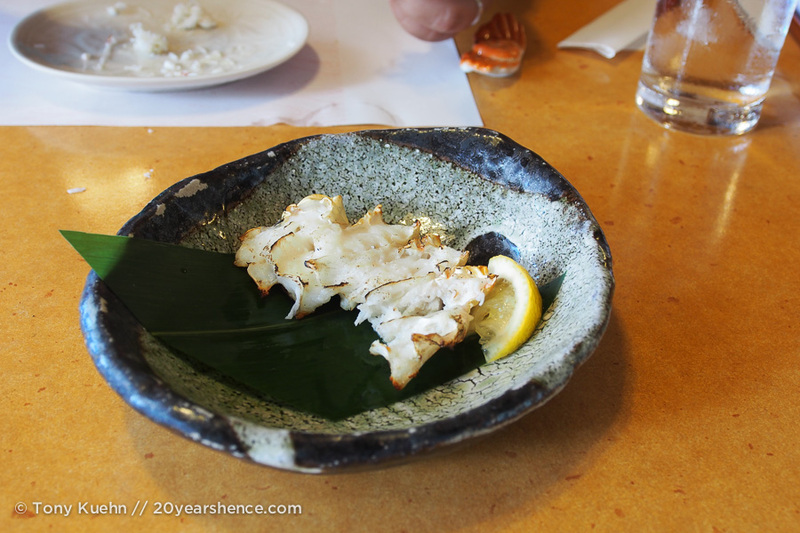 Prices were high, so we opted to split a combo lunch, which allowed us to taste crab that had been prepared in a variety of different ways, including several we had never before seen, such as crab sashimi and baked in an egg custard. 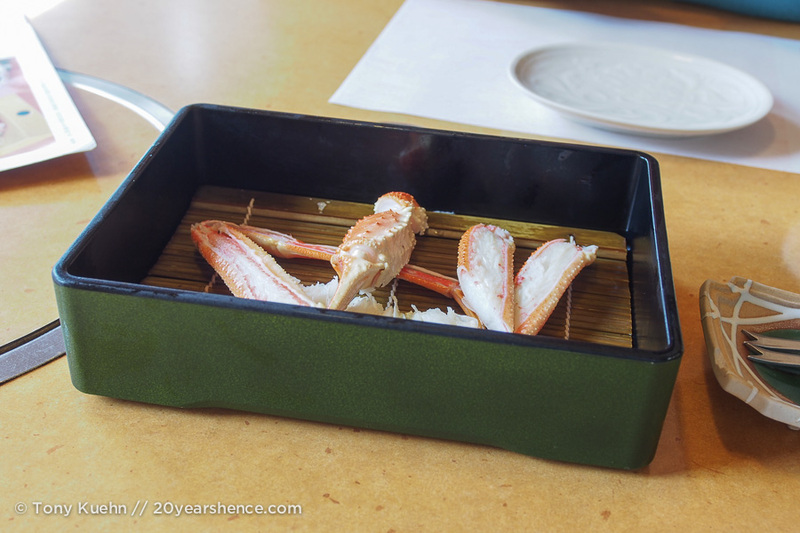 Although crab was featured in all of the dishes we tried, what was most impressive was how different aspects of the crab’s flavor were emphasized with each dish and preparation we tried. 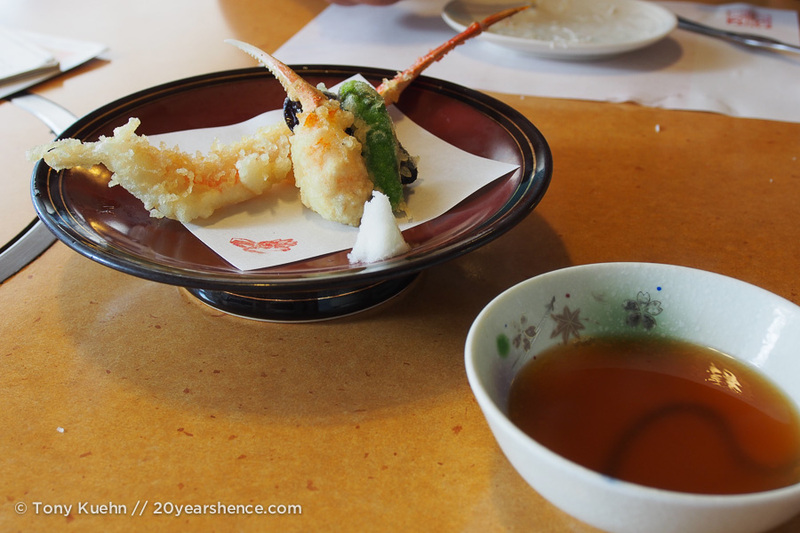 The sashimi accentuated the natural sweetness of the crab, whereas the grilled preparation highlighted a nutty undertone to the meat, and the tempura crab was succulent and fattier. Although the restaurant may be considered something of a tourist trap, we both immensely enjoyed our meal there, and we left with a new-found appreciation of this crustacean. As an added bonus, the restaurant has a prime location and our table on one of the upper floors provided us with a stellar view of the hustle and bustle of Dontunburi. We also continued our love affair with fried food. 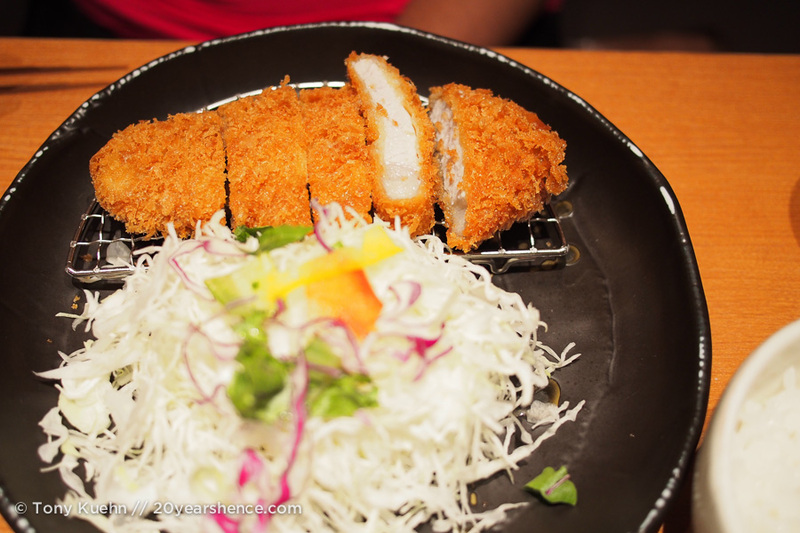 Wanting to sneak in one more tonkatsu meal before we left for Hong Kong, we unwittingly wandered into the exact same chain we had chosen to eat at in Nara! It was an unintentional repeat (and we only realized our mistake when we started leafing through the menu and discovered it looked awfully familiar), but the food was still excellent so it was a happy accident! Whatever this place is called, they definitely know how to fry their pork cutlets perfectly. Faithful readers will recall that along with fried food, Tony and I tend to enjoy meals served to us on sticks. 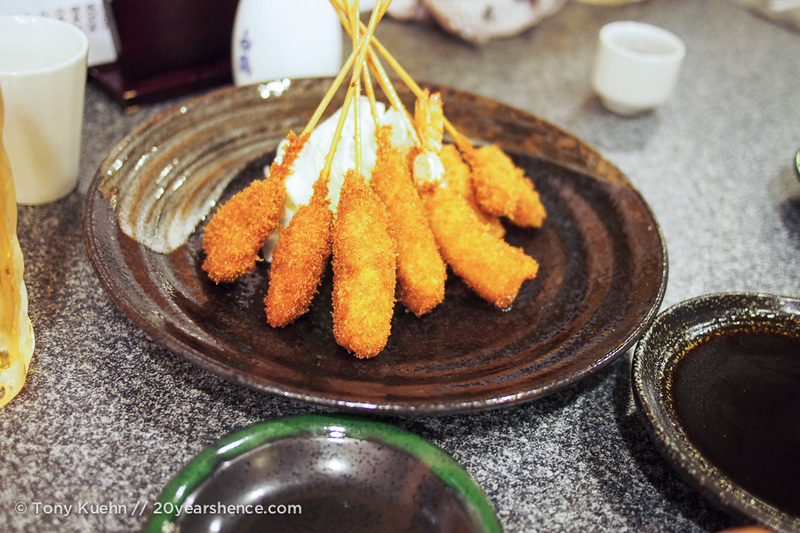 In Osaka, we got to experience the delightful intersection of these two food styles, as we sampled the naughtier version of yakitori, known as kushikats. 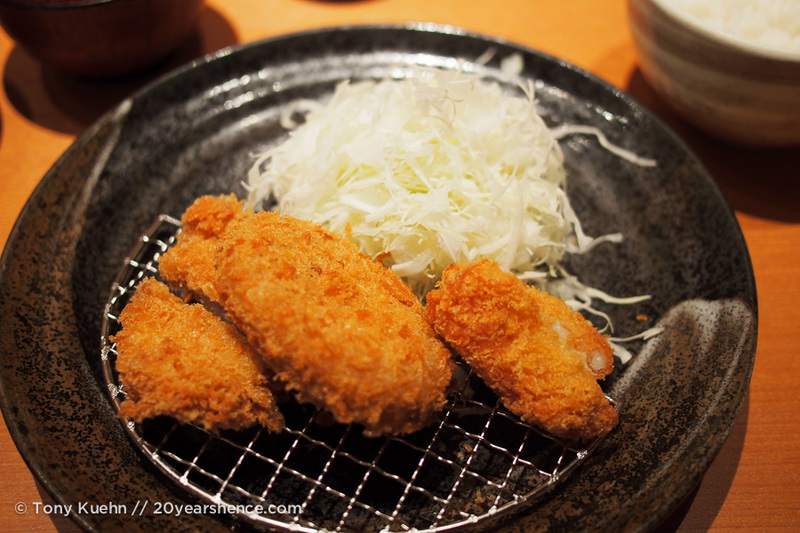 Various ingredients are skewered and then breaded and fried instead of grilled. We picked a place at random, only to find that it didn’t have much English, so we just pointed to a random photo in the menu, crossed our fingers and hoped for the best! As you can see, with kushikatsu, mystery dishes are made even more mysterious as the only way to figure out what the blobby fried thing in front of you is to pick it up and eat it! Our assortment of skewers involved shrimp, chicken, pork, lotus root, and onion. All of it was good (if unremarkable), but this was also the one place in Japan where we found the proprietess wasn’t very friendly or invested in helping us (there was almost no English on the menu), so after this plate of food, we paid our bill and went in search of more snacks! We wandered the labyrinthine streets that coil together to form the Dontonburi core, which flooded with late-night partiers. As we rode the wave of people, we remarked that this one section of Osaka felt like what you would get if you took all the craziest parts of Tokyo and compressed them together into one hyper-concentrated amalgam. While you could spend ages on the subway in Tokyo traveling from one district to another, it seemed that everything we needed was at our fingertips (or at the very least, within walking distance) right here in Osaka. 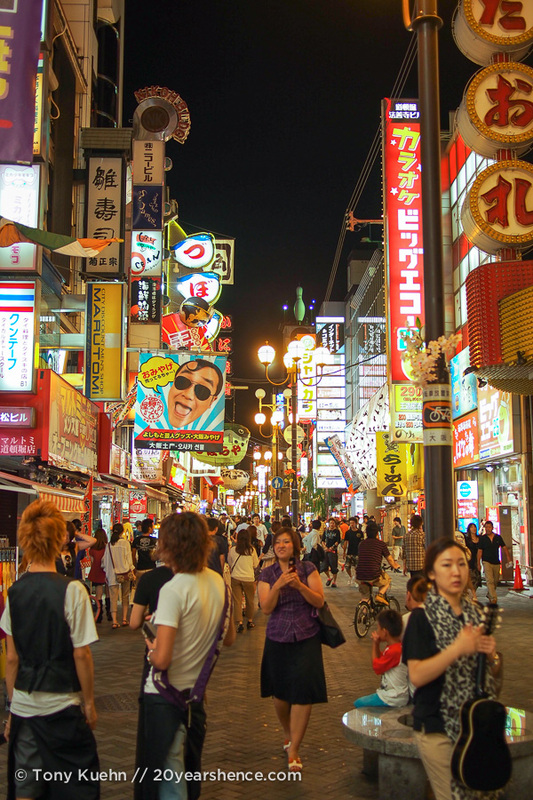 Unlike most of Asia, Japan is definitely not a country with a thriving street food scene. Given the lack of benches and trash bins, eating on the street is something that is not done… except in Osaka! As we roamed the streets in search of sustenance, we passed vendors selling sushi and takoyaki, but it was a little stall selling nuggets of fried chicken that finally roped us in. 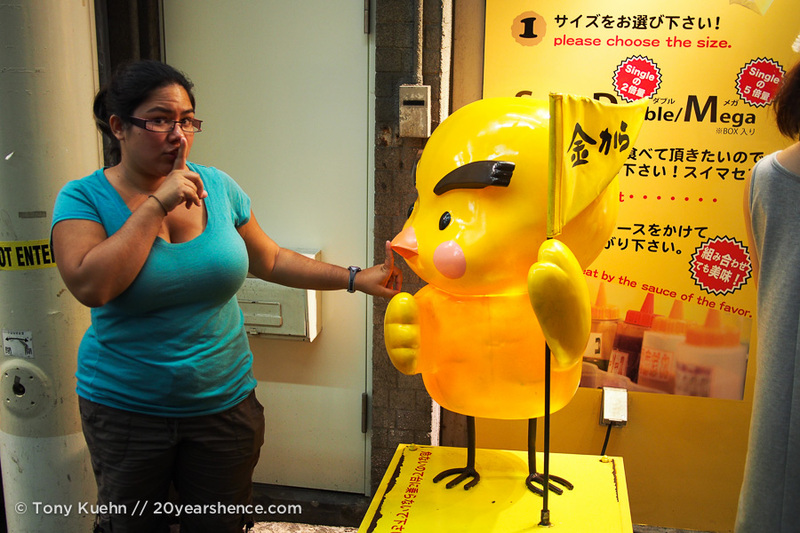 Squirting in a variety of mystery sauces and snagging a can of peach nectar from the ubiquitous vending machines that line the streets all over Japan, we were good to go! Knowing that our time in Japan was drawing to a close, we decided we could no longer delay the inevitable and that the time had finally come to try the Yoshinoya fast food chain. 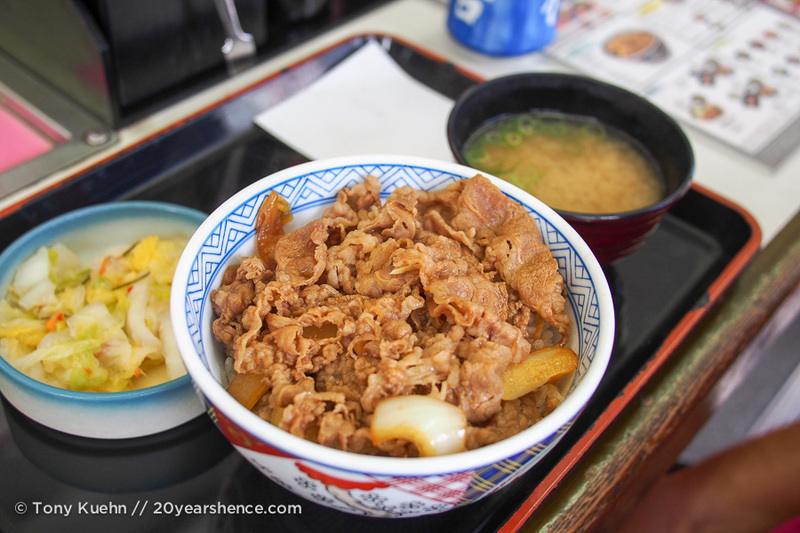 Although plenty of Western fast food restaurants can be found in Japan, Yoshinoya is Japanese through and through. You won’t find any burgers and fries here, just rice bowls topped with different kind of meats. Our friend L’Ell had cast doubts in our mind as to the authenticity of the actual meat contained in a Yoshinoya Beef Bowl, so you can imagine our surprise when we discovered that the food was actually kind of good! It was by no means gourmet, but it was filling, reasonably tasty (in a junk food kind of way) and best of all, cheap! 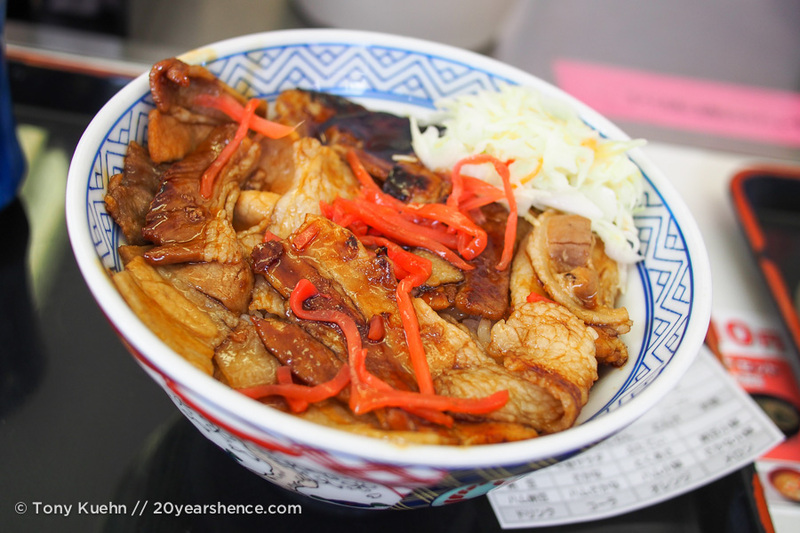 At just 490Y (~$6USD) per person for a rice bowl with sides such as pickled cabbage and miso soup, Yoshinoya is one of a budget traveler’s best friends when visiting Japan. Astute readers will notice that although we tried a lot of different things in Osaka given our short stay there, a few obvious choices are missing from our binge. Most notably, we refrained from trying okonomiyaki (Osakan-style) and takoyaki (fried octopus balls). 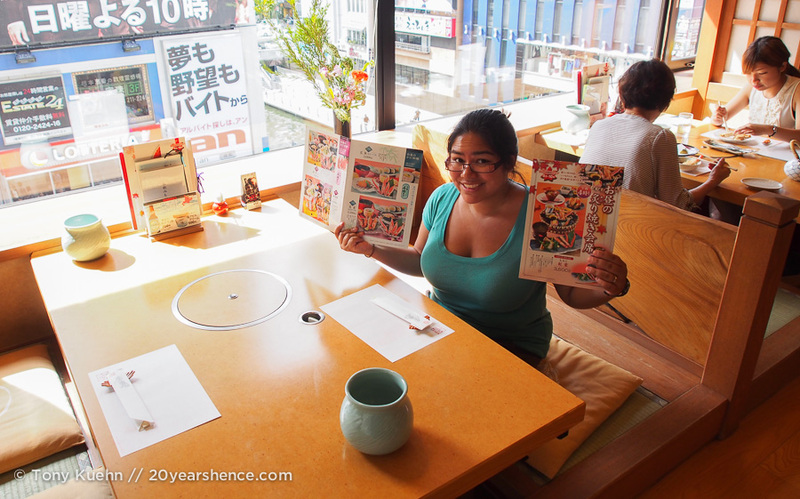 Although I know that these are some of the most famous dishes in Osaka, in all honesty, our sampling of okonomiyaki in Hiroshima was enough to last us a lifetime and we didn’t relish the idea of trying it again, just so we could say we had. Similarly, whenever we caught a whiff of takoyaki, it so strongly reminded us of okonomiyaki that we immediately lost our appetites! 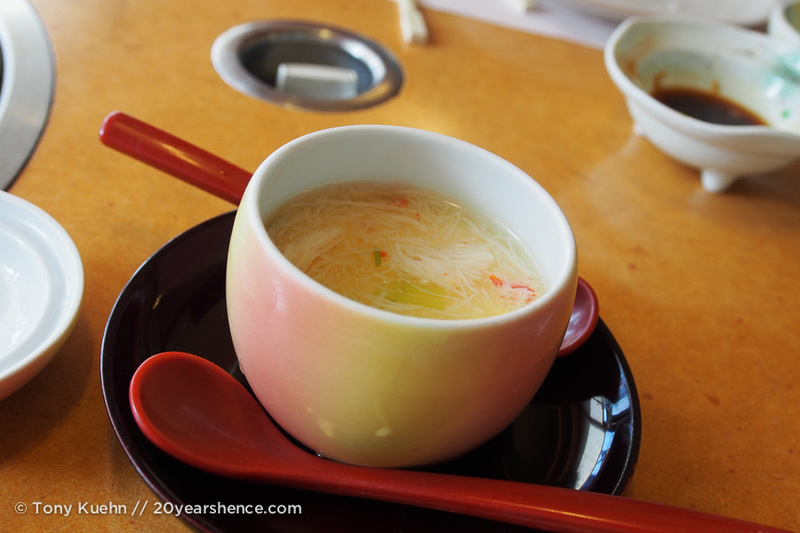 I know both of these dishes are insanely popular in Osaka and some people will think it scandalous that we overlooked them, but for the sake of our gag reflex, we had to give these dishes a miss this time around! Our two days spent in Osaka were the perfect way to cap off the Japan leg of our trip. As a bookend to Tokyo, Osaka was a distillation of the vibrancy and insanity that we had hoped to find in Japan’s capital city. It was the modern, space-age Japan we had been hoping to experience, and provided us with the perfect platform to say goodbye to the country in one final sensory bender. When you get back to TO I’ll make you guys takoyaki (I have a special takoyaki cooker) and we’ll see if you like it! Good for you for braving Yoshinoya. I feel the same about it as I do Taco Bell. How can they sell meat for that cheap? And if they can, do I really want to eat it? But you’re right, when looking for a budget meal – I guess it’s ok! And I definitely see your Yoshinoya = Taco Bell comparisons! It’s certainly not my first (or even 10th!) choice in Japan when there are so many other delicious and less suspicious food options, but as a quick cheap meal, it wasn’t nearly as bad as I had feared. It is also a mistake to write these posts at 10 am in the morning… and here in the Philippines no less, where we love it, but the food… it is lacking…. I feel like all I comment on lately is how much I want to eat the food in your posts 🙂 Looks like you guys had a great time in Osaka! I went to the crab restaurant too. Did you see the giant rotating takoyaki balls sign too? And ditto on how amazing the Kaiyukan is!!!!!!! Rika @ Cubicle Throwdown recently posted..A night out in West End. Yum, yum, and…umm…yum. I would love Japanese food right now! Rice bowl, noodle bowl, or sushi. 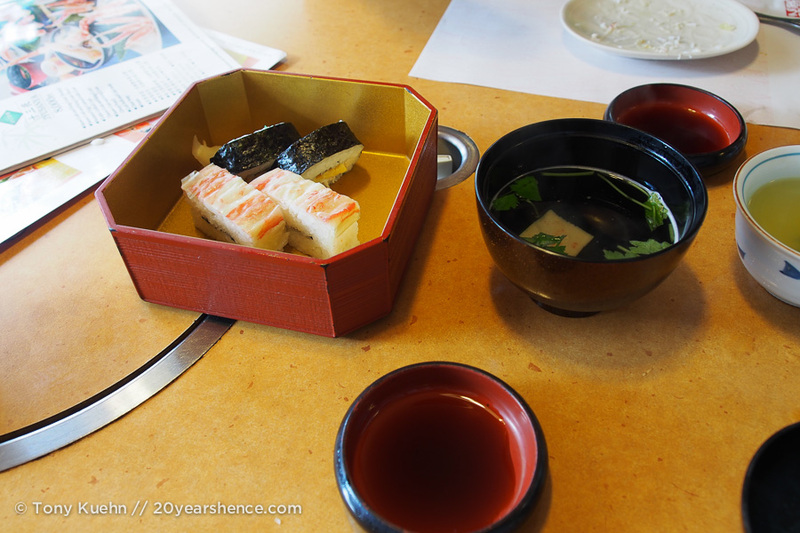 I really miss eating in Japan! I would actually love some Japanese food right now too! I was getting a bit tired of it by the end of our time in Japan, but it didn’t take very long for me to start craving sushi and soba again! Osaka seems to be often overlooked by visitors to Japan which is a shame as we really loved it there! The atmosphere is so lively, the shopping is great, and the food is amazing. It offers a slice of modern Japan that we found really rewarding, so I would highly recommend travelers make an effort to visit it! Some yummie meals here! Some of them kind of look like dishes we have here in Korea. We definitely have a Japanese influence on Korean cuisine.